A review of Saving Metropolis: Body and City in the Metropolis Tales, by Lawrence Bird. Film and architecture share much in common: both are public, capital-intensive art forms, both are inherently collaborative, and both structure our experience of time and space in ways as inscrutable as they are pervasive. It is therefore surprising that more work, theoretical and historiographical, has not been done exploring the intersections and interstices of these two modes of cultural production. Lawrence Bird’s dissertation is an ambitious interdisciplinary and comparative foray in that direction, and then some. Bird’s ambitions are decidedly theoretical, and manga and anime take equal place alongside live-action film in his purview. The theme circumscribing this potentially vast territory is that of Metropolis: Fritz Lang’s seminal expressionist science-fiction film of 1926, and two of its offspring: Tezuka Osamu’s 手塚治虫 1949 manga of the same name (Metoroporisu メトロポリス), and Rintarō’s りんたろう 2001 anime based loosely on Tezuka’s manga. The dissertation is essentially a close reading of these three works framed within a larger theoretical discussion the stakes of which extend beyond the works themselves. The medium interlinking the variegated forms of cultural production Bird addresses here is the human body, and the primary theoretical basis of his discussion is the phenomenology of perception. His two epigraphs announce the theoretical pillars of the work, Gilles Deleuze and Maurice Merleau-Ponty, and his Introduction announces what is at stake: “The imagery of urban destruction, disturbingly, suggests a denial of the prospect of any sort of architecture, and attempt to give the world a form and, by implication, a meaning. It suggests the fundamental impossibility, in our times, of cities and what they can and should stand for — a meaningful shared existence” (p. 11). This is a dissertation about film, manga, and anime that is directed at architects, but Lawrence Bird’s discussion will be of interest to scholars of media, modernity, and Japan studies as well. He finds in twentieth-century Japanese culture fertile ground for an exploration of urban apocalypse, as well as a non-Western counterpoint to largely Western discussions of his chosen thematic. Although his focus is on imagined cities (and the imagined bodies within them), he takes care to point out that “the imagined city is not autonomous of the real city” and that what is at stake in his discussion are not simply matters of representation, but also the shape of real environments, “the bed of our problematic condition, the medium by which the modern problem acts upon our bodies” (p. 16). The first part of the study proper is divided into three parts, each devoted to one of the Metropolis tales. All of the narratives involve a technologized body, a robot or cyborg, and the differences among them provide Bird with important indices of historical change across the twentieth century. Another important index, of course, is the different ways in which the different media — film, manga, and anime — represent (largely dystopian) urban spaces and the bodies that inhabit them. The chapter on Lang (“Lang: Arc”) explores the problematic established by the film’s opening and closing aphorism: “The Mediator between Head and Hands must be the Heart!” Bird discerns in Lang’s film a play between depth and flatness and between the machinic and the organic that the film ultimately disavows in favor of a simplifying vision of organic unity, a renunciation of depth. Chapter 2, “Tezuka: Affect,” takes a double leap, from the interwar to the postwar and from Germany to Japan. Whereas the technologized body in Fritz Lang retained a strict boundary between the machinic and the organic, that of Tezuka destabilizes and blurs it. Bird takes the thread of roboticism and begins here to weave it with threads of Japanese tradition: medieval comic art, Edo period ukiyo-e 浮世絵 woodcuts, and katakuri ningyō からくり人形, the mechanical dolls that appeared in the eighteenth century. Bird tentatively suggests that a different relationship with technology in Japan vis-à-vis the West allows Tezuka to explore phenomena such as “affective robots” (p. 89) and “affective cities” (p. 92) in ways that wouldn’t have been available to Lang. Bird buttresses his reading with Deleuze and Merleau-Ponty’s discussions of affect. It is also in a postscript to this chapter that Bird brings Murakami Takashi’s 村上隆 Superflat aesthetic into collision with Deleuze’s notion of the “any-space-whatever” (articulated in Cinema 1: The Movement Image. Minneapolis: University of Minnesota Press, 1986) in a novel and productive way that anyone engaged with either thinker would find of interest. The third chapter, “Rintarō: Void,” brings us to something like the present, and introduces a new set of formal and conceptual considerations: color, multi-dimensionality, the relationships between visible and invisible, surface and depth, being and void. Bird sees in this latest of the Metropolis tales both a continuation of its forebears and a departure: “But unlike Lang’s, which operated through the encroaching of dark onto light and vice versa, Rintarō’s labyrinth (building on Tezuka’s capacity to do just this) operates in that margin, in its colorful surface” (p. 153). That labyrinth itself becomes flesh and is ultimately ripped apart, but Bird suggests that that ripping apart is a necessary moment of reconception: “Things come together in coming apart, before things are named” (p. 156). In the second part of the thesis, “Beyond the Tales,” Bird opens up his vista while at the same time addressing the concerns of architects more directly. In chapters entitled “Other Anime: The Thick Flat,” “Technology and Poeisis,” and “Architectures,” he offers both larger generalizations about the condition of modernity as well as a body of localized insights about specific postwar Japanese buildings and works of anime other than Metropolis. He also brings in new theoretical interlocutors to join Deleuze and Merleau-Ponty, most prominently Georges Didi-Huberman, whose Confronting Images: Questioning the Ends of a Certain History of Art (University Park, PA: Penn State Press, 2005) emerges as something of a third pillar in Bird’s theoretical edifice. That edifice could seem forbidding to one unfamiliar with Deleuze and Merleau-Ponty’s work, but Bird strives at all times to be intelligible, and one never gets a sense of difficulty for its own sake, much less of obfuscation. He is clearly passionate about his invaluable project, and about initiating a conversation about bodies, urban spaces, and technology in which architects and scholars from a range of disciplines can participate. McGill University. 2009. 210 pp. Primary Advisor: Alberto Pérez-Gómez. 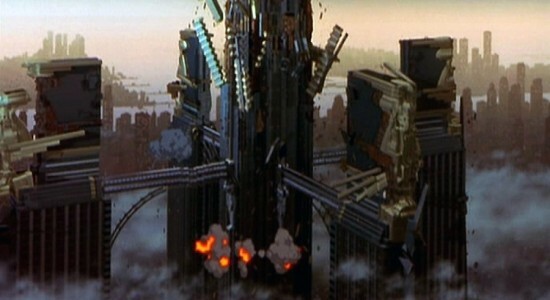 Image: Climactic destruction of the city, in the animated Metropolis. Rintarō, Metoroporisu (animated film, 2001). Columbia Tristar.